In December 2016, I had my 12×12″ collage, Hello, Kitty showing at the Portland Building, 1120 SW Fifth Avenue, Lobby for the RACC ‘All the Art that Fits” show for city and county employees. I also had my 12×12″ collage, Ode to Alfred, showing and for sale with another smaller collage at SCRAP PDX holiday show. The two pieces at SCRAP PDX sold and all proceeds benefitted SCRAP PDX. Instead of “Black Friday” on Friday, November 25, 2016, several artists and volunteers tabled at SCRAP PDX. I showed customers and families how to make simple holiday cards from found materials. After seeing the the empty wall at SCRAP, I decided it was time to create an ultimate creative reuse found objects collage. I collected small bits, toys, caps, lids, buttons, etc. and sorted them by colors of the rainbow. After gluing all of my pieces on, and finally coating with a clear coat to prevent dis coloring. I delivered it to SCRAP tonight at their new location on SW 18th and Alder in Portland, Oregon. The piece is 24″x34″ approximately. One of my pieces, “Next Please” is showing at Flux Salon at 515 SE 11th Avenue, Portland, OR 97214 in honor of Sexual Abuse Awareness month. My second piece was accepted “Writer’s Block” to show at Whole Foods in the Pearl, 1210 NW Couch St. First Thursday opening on April 5 from 5-8 pm, refreshments provided. 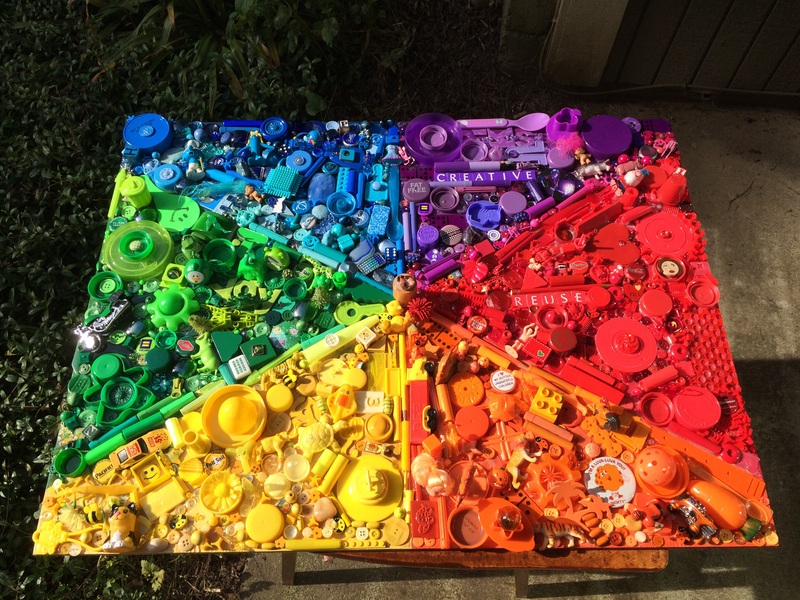 Artwork contains at least 75% reused materials. This show is in honor of Earth Month and is presented by SCRAP (http://scrappdx.org), and Whole Foods Market. April is Sexual Abuse Awareness month. To increase awareness Flux Salon (www.fluxsalon.org) is showcasing a photo installation of survivors of sexual abuse. Also, all art on display this month was produced by survivors of sexual abuse.